Each year, the USDA’s National Agricultural Statistics Service (NASS) provides a series of estimates of planted acreage of corn and soybeans in the U.S. That series begins with an estimate of planting intentions and ends with a final estimate of acreage actually planted. There is obvious interest in the magnitude of the final NASS estimates of planted acreage of corn and soybeans in 2015 as those estimates will impact final production estimates. Those estimates in turn will impact the projected supply/demand balance and price prospects for the 2015-16 marketing year. In this article, we review the progression of USDA planted acreage estimates for a particular crop year and then use estimates available through October 2015 to anticipate final planted acreage for 2015. First in the cycle of USDA acreage estimates is the Prospective Plantings report, currently released at the end of March. This report reveals producer planting intentions for the current crop year and estimates are based primarily on the March Agricultural Survey, a survey of farm operators conducted in late February and early March. The survey is a probability survey in the sense that operations surveyed represent a sample drawn from a list of all producers in such a way that all operations have a chance to be included. This is referred to as a list frame sample. In 2015, for example, approximately 84,000 farm operators were contacted by mail, internet, telephone, or personal interview. Surveyed producers are asked to report acres planted or to be planted this spring or this summer for the (current) crop year. Second in the cycle of acreage is the Acreage report released at the end of June each year. The estimates of planted and harvested acreage in this report are based primarily on two surveys conducted in roughly the first two weeks of June. The first survey is referred to as the list frame survey since a sample of operations to be surveyed is drawn from the list of all operations (like the earlier survey for the Prospective Plantings report). In 2015, for example, over 70,000 farm operations were surveyed by phone, mail, internet, or personal interview. Farm operations selected for the list frame sample are asked to report acres of corn planted or intended to be planted for all purposes (excluding popcorn and sweet corn) and to report separately the acres intended for harvest for grain and for seed. Operators are asked to report acres of soybeans planted or to be planted for all purposes and acres intended to be harvested. Single cropped and double cropped acres are reported separately. The second June survey is the area frame survey. This is described as a multi-step process. All land in each state is classified based on intensity of cultivation using a “…variety of map products, satellite imagery, and computer software packages”. Intensively cultivated areas are divided into 1 square mile segments, while less intensively cultivated areas are divided into smaller segments, down to 0.1 square mile for urban areas. Segments in intensely cultivated areas are selected at the rate of about 1 out of 125 and segments in areas of lesser intensity of cultivation are selected at the rate of 1 out of 250 to 500. In 2015, about 11,000 total segments were selected in the area frame survey. Enumerators (those employed by NASS to interview segment operators and take measurements) identify the exact location of each segment and personally interview every operator with land within the segment. Crops planted or intended to be planted and acreage intended for harvest in each field are identified. Data from the two surveys (list and area frame) are combined in such a way as to account for all acreage, but to avoid double-counting of acreage. Third in the cycle of acreage estimates comes with the USDA’s October Crop Production report. NASS does not conduct a special acreage survey for this report, but like the earlier Crop Production reports in the cycle (August and September) information in the Agricultural Survey could be used to adjust acreage estimates. In October, however, NASS does use administrative data to complement their acreage survey data. The primary administrative data used in the report is acreage data reported to the USDA’s Farm Service Agency (FSA). As indicated on the FSA website, “Farm Service Agency policy requires that producers participating in several programs submit an annual report regarding all cropland use on their farms.” So, in theory, the FSA acreage data represent a complete census of acreage enrolled in the farm programs administered by the FSA. While the final report of planted acreage by FSA is not issued until January, the acreage in the October report is typically very near the final acreage reported in January so NASS uses this administrative data to adjust its planted acreage estimates. Fourth, and final for corn but not for soybeans, in the cycle of acreage estimates comes with the USDA’s Crop Production Annual Summary report released in January after harvest. As indicated in the 2014 summary “The estimates in this report are based primarily on surveys conducted the first two weeks of December. The December Agricultural Survey (DAS) is a probability survey that includes a sample of over 83,000 farm operators selected from a list of producers that ensures all operations in the United States have a chance to be selected. These operators were contacted by mail, internet, telephone, or personal interview to obtain information on crop acreage, yield and production for the 2014 crop year.” The January acreage estimates produced by NASS are widely considered to be “final” estimates for a crop year. Fifth, and final for soybeans, in the cycle of acreage estimates comes with the USDA’s September Grain Stocks report. This report contains the estimate of old crop inventory at the end of the previous marketing year (August-September). For soybeans, data from various sources provide a generally accurate accounting of consumption during the previous marketing year. If the end-of-year stocks estimate implies an unusually large or small residual (unexplained) use of soybeans during that marketing year, NASS will review the January production estimate to determine if that estimate should be revised. Both the yield and acreage estimates are subject to change. Our conversations with NASS statisticians indicate the changes are typically no more than one standard error from the previous estimate. For example, as indicated in the 2015 report “Based on an analysis of end-of-marketing year stock estimates, disappearance data for exports and crushings, and farm program administrative data, the 2014 soybean production is revised to 3.93 billion bushels, down 41.7 million bushels from the previous estimate. Planted area is revised down 425,000 acres to 83.3 million acres, and harvested area is revised down 470,000 acres to 82.6 million acres. The 2014 yield, at 47.5 bushels per acre, is down 0.3 bushel from the previous estimate.” In contrast to soybeans, available sources of do not provide a sufficiently accurate accounting of corn consumption for the September 1 stocks estimate to be used to revise the previous year’s production, and therefore, acreage estimate (Irwin, Sanders, and Good, 2014). Table 1 presents the estimates of corn and soybean acreage for the complete cycle for the 2014 crops and for the cycle through October for the 2015 crops. Last year, the difference between the March acreage estimate and the final acreage estimate was 1.094 million for corn and 1.783 million for soybeans. The change from the October to final estimate totaled 288,000 acres for corn and 908,000 acres for soybeans. For the current year, planted corn acreage estimates declined in June and again in October, for a total decline of 818,000 acres from March. For soybeans, the June estimate was well above the March estimate, but estimates declined in August and October, so that the October estimate was 1.43 million less than the March estimate. There is obvious interest in where the final planted acreage estimates will end up this year. Since final NASS acreage estimates make use of planted acreage data reported to FSA, the historical relationship between the final planted acreage estimates from those two sources may provide some insight into the final NASS estimates for 2015. The relationship between final planted acreage estimates from those two sources for the years 2007 through 2014, along with October estimates for 2015, are presented in Tables 2 and 3. 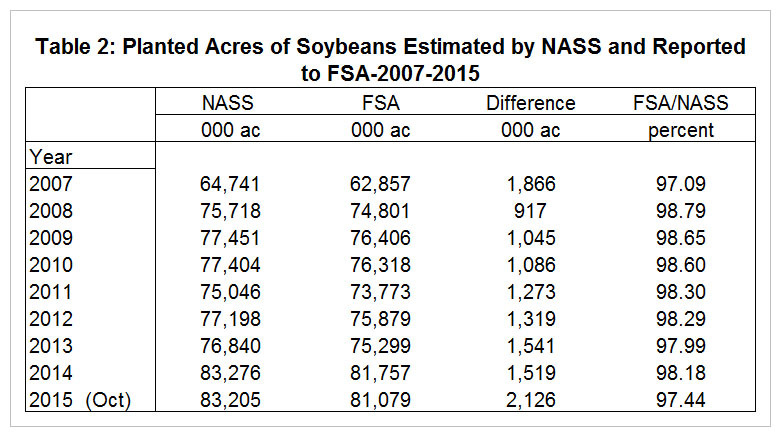 As indicated in Table 2, the relationship between NASS and FSA final planted acreage estimates for soybeans was generally consistent from 2007 through 2014. Acreage reported to FSA was less than the NASS acreage estimates since not all producers participate in federal farm programs that require acreage reporting. The difference ranged from 917,000 to 1.866 million acres. FSA acreage as a percentage of NASS acreage ranged from 97.09 percent to 98.79 percent. The relationship was especially consistent from 2011 through 2014. In October this year, the NASS estimate of planted acreage was 2.126 million acres less than acreage that had been reported to FSA. FSA acreage accounted for only 97.44 percent of the NASS estimate. The historical relationship suggests that the differences reported in October will be narrower in the final estimates. Acreage reported to FSA could increase from the October report of 81.079 million acres. The FSA final acreage report in January was the same as the October report in 2011, was only 65,000 acres larger in 2012, and was only 147,000 acres larger in 2013. Last year, however, the January acreage report exceeded the October report by 754,000 acres. We believe last year’s increase was an anomaly associated with the lateness of the crop and do not anticipate such a large increase this year. Without a large increase in the FSA acreage estimate, we would anticipate that the final NASS estimate of soybean planted acreage could be 300,000 to 400,000 acres less than the October estimate of 83.205 million acres. If the FSA acreage increase is larger than anticipated, that will likely be revealed in the November and/or December reports as it was last year. 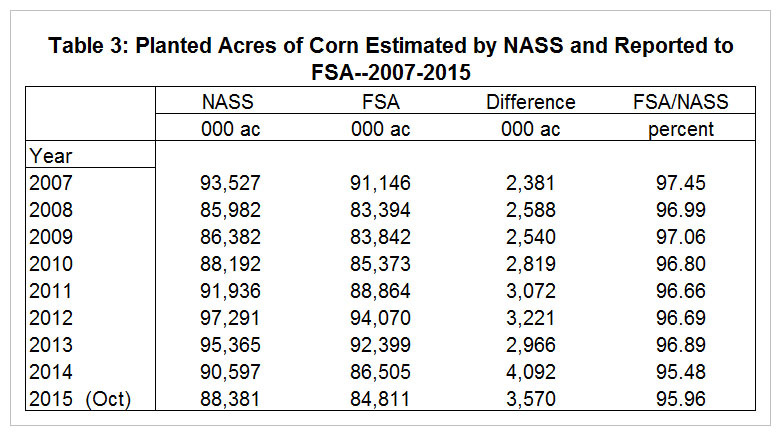 As indicated in Table 3, the relationship between NASS and FSA final planted acreage estimates for corn was very consistent from 2007 through 2013. Acreage reported to FSA was less than the NASS acreage estimates since not all producers participate in federal farm programs that require acreage reporting. The difference ranged from 2.381 to 3.072 million acres. FSA acreage as a percentage of NASS acreage ranged from 96.66 percent to 97.45 percent. Last year, however, the difference was 4.092 million acres and FSA acreage accounted for only 95.48 percent. The reasons for the large difference last year are not apparent. Some have argued that the large difference in acreage estimates reflected a lower rate of participation in federal crop programs as programs changed dramatically. However, that argument is not supported by the soybean acreage relationships. In addition, decisions about participating in the 2014 farm programs were made well after acreage was reported to FSA. We believe that it is more likely that NASS survey results resulted in an over-estimate of planted acreage of corn in 2014, as was the case for soybeans. If the NASS corn planted acreage estimate was reduced by 0.05 percent, in line with the reduction in the soybean planted acreage estimate in the September Grain Stocks report, planted acreage would have been 90.137 million. That would still be 3.632 million less than the FSA estimate and FSA acreage would account for 95.97 percent of the reduced NASS acreage estimate. Last year’s relationship between NASS and FSA final acreage estimates makes it more difficult to anticipate the relationship this year. In October, the NASS planted acreage estimate of 88.381 million was 3.57 million less than FSA acreage and FSA acreage accounted for only 95.96 percent of the NASS acreage estimate. Acreage reported to FSA could increase from the October report of 84.811 million acres. The FSA final acreage report in January was only 76,000 acres larger than the October report in 2011, was only 126,000 acres larger in 2012, and was only 236,000 acres larger in 2013. Last year, however, the January acreage report exceeded the October report by 1.301 acres. Like soybeans, we believe last year’s increase was an anomaly associated with the lateness of the crop and do not anticipate such a large increase this year. Even without a large increase, however, we have less confidence about where the final NASS acreage estimate for corn will come in. If the November/December FSA reports show only a modest increase in acreage, a return to the historical relationship between NASS and FSA final acreage estimates would point to a decline in the NASS acreage estimate. Even so, the decline would not be large which reduces the odds of a change in the January 2015 Crop Production Annual Summary. There is obvious interest in the magnitude of the final NASS estimates of planted acreage of corn and soybeans in 2015 as those estimates will impact final production estimates. Those estimates in turn will impact the projected supply/demand balance and price prospects for the 2015-16 marketing year. The historical relationship between the final NASS and final FSA acreage estimates and the historical relationship between FSA October and final acreage numbers point to a slight decline in NASS planted acreage estimates from those made in October. The case for a decline is stronger for soybeans, but even this turns out to be correct, the decline may not be revealed until September 2016, as was the case this year. Which Way for Soybean Prices?